Seabiscuit was one of the most remarkable Thoroughbred racehorses in history. From 1936 to 1940, Americans thronged to racetracks to watch the small, ungainly racehorse become a champion. He had an awkward gait but ran with dominating speed; he was mild-mannered yet fiercely competitive; and he was stubborn until he became compliant. His inferior performances as a young racehorse led to later dominance on the turf. Worse still, as a young horse, he had shown little interest in running at full speed. “He was lazy,” asserted James Fitzsimmons, Seabiscuit’s first trainer, “dead lazy.” In retrospect, it appears the horse’s poor performance and attitude had more to do with the way he was treated than with his ability or character. As a three-year-old, the horse had run in 43 races, more than many Thoroughbreds complete in an entire career. To get him to achieve the speed they suspected he had, riders whipped him liberally. Smith began Seabiscuit’s rehabilitation by feeding him a high-quality Timothy hay and letting him sleep as late as he wanted. The trainer, well aware that horses are fond of company, created a large stall for the new boarder, and moved in a sedate old horse named Pumpkin, a calming influence who would become Seabiscuit’s life-long companion. A stray dog named Pocatell took a liking to the stall and also moved in; so did a spider monkey living on the premises, named Jo-Jo. In the company of this strange menagerie, Seabiscuit relaxed, and the real work of training got underway. When Smith brought him back to the racetrack with his new jockey, Red Pollard, in the saddle, the Biscuit shocked them all. At different tracks and varying distances, Seabiscuit won. Soon, horse aficionados were picking him as a serious contender for the prestigious Santa Anita Handicap in southern Los Angeles, known for its $100,000 winner-take-all prize. In February 1937, Seabiscuit turned in a dazzling performance in the Handicap, but lost by just a nose after Pollard let up in the home stretch. His second place finish, though, catapulted the horse onto the national stage. In March, Howard packed his horse off on an extensive cross-country racing campaign. 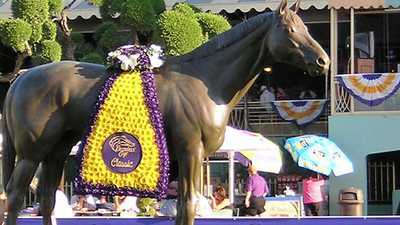 “Seabiscuit will take on all comers,” he informed the press, “and he’ll mow them down like grass.” Howard was right; that spring and summer Seabiscuit flattened the competition up and down the Eastern seaboard. By August, there seemed to be only one horse who hadn’t fallen to Seabiscuit’s charge: the 1937 Triple Crown winner, War Animal. The stallion was the son of Man o'War and considered by many to be the sole heir of his sire’s awesome speed. The two horses finally met in a highly anticipated one-on-one match on November 1, 1938, at Maryland’s Pimlico Racecourse. 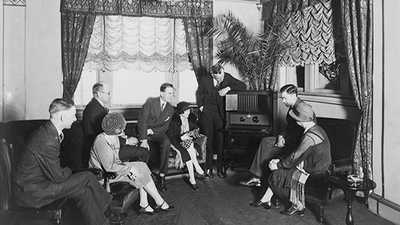 Across the country, 40 million people — one out of every three Americans — tuned in their radios to listen. In their hearts, many Americans rooted for the underdog, Seabiscuit. But most placed their bets on War Admiral. Almost everyone expected War Admiral to streak to the lead, but it was Seabiscuit, carefully trained to bolt full-force from the starting line, who shot to the lead and set the pace. He was out front most of the race, but on the backstretch before the last turn, in an unorthodox move, Seabiscuit’s jockey that day, George Woolf, slowed him down, allowing War Admiral to catch up. “Once a horse gives Seabiscuit the old look-in-the-eye,” Red Pollard, sidelined by an injury, had told Woolf the night before the race, “he begins to run to parts unknown.” That’s just what the horse did. 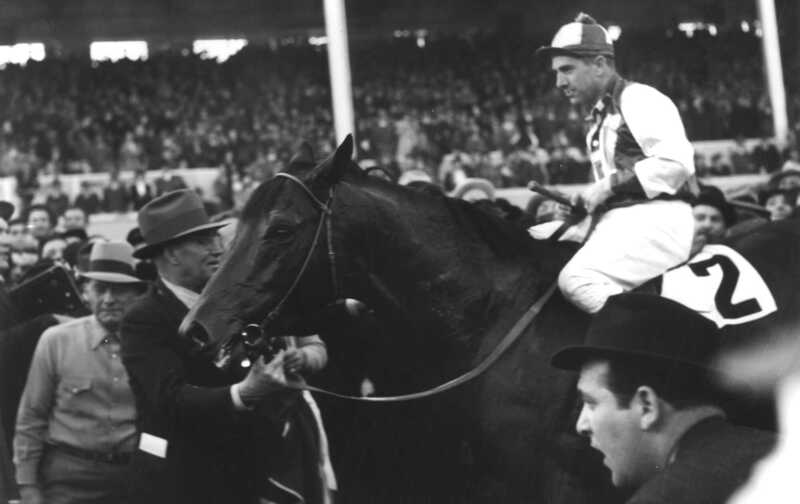 He pulled away from War Admiral in the stretch, winning the horse race of the century by four lengths. 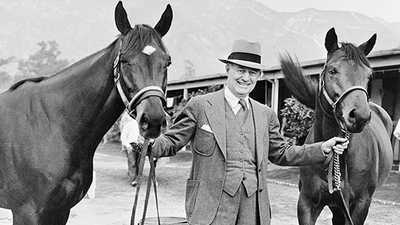 Late in the fall of 1939, Seabiscuit’s handlers made an almost inconceivable announcement: Seabiscuit would run again in the Santa Anita Handicap scheduled for March 1940. It would be his third try at the hundred-grander. The first time, he had lost by a nose to Rosemont. The second time, he had been badly bumped at the start, and though he had made one of the most remarkable comebacks in racing history, he had lost at the wire again. This time the horse would be seven years old, ancient by racing standards. Pollard, whose injured leg was still fragile, would ride him. Hoping for a chance to fight in the the Spanish-American War, Howard enlisted in the cavalry and became a skilled horseman. America’s favorite underdog died young, succumbing to a heart attack at age 14.